SINGAPORE, / BANDAR SERI BEGAWAN -- With the first operational use of the Pilatus PC-7 Mk. 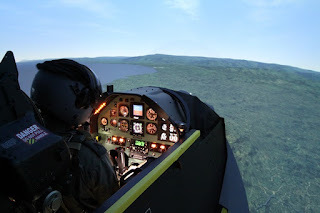 II flight training device (FTD) in November 2014, the Royal Brunei Air Force (RBAF) has been able to move its training emphasis away from the aircraft and into the synthetic environment. Agreed in 2012 and established in September 2014, the Brunei Multi-Purpose Training Centre (MPTC) is a business venture between the Brunei Government’s Ministry of Finance and CAE. Encompassing training provision for disaster management, medical clinician teams and aircrew, the MPTC is designed to be a training centre of excellence for customers within ASEAN, the wider Asia-Pacific region and the Middle East. The MPTC currently has a Sikorsky S-92 full flight simulator (FFS) that is used by a number of Brunei-based and overseas customers and a Pilatus PC-7 Mk. II flight training device (FTD) that is solely used by the Royal Brunei Air Force (RBAF). This device supports the RBAF’s fleet of four PC-7s that were delivered in 1997. A Sikorsky S-70i FFS is due to be delivered later this year. Another success story for the PC-7 FTD has been in its use as a flight screener. The flight screening process is applied to students who wish to become pilots. They are given a small number of exercises in the FTD to access aptitude, learning ability and general airmanship awareness. This selection process reduces wastage once the students actually embark on the ab initio training. Introduced in 2015, the screening process has enabled the RBAF to accept six personnel for ab initio training later this year. As a result of the aptitude indicators derived from the PC-7 screening, the top two are being sent to Fort Rucker. While the location of training for the remaining four is yet to be decided, likely candidate sites include Tamworth in Australia or RAF Shawbury in the UK. This Fort Rucker option is understood to be the first time that RBAF pilots will have undertaken ab initio training at this location. This initiative is part of the US Government deal that is integral to the sale of 12 Sikorsky S-70i helicopters to the RBAF. These aircraft have now all been delivered to the RBAF although some have been retained in the US for training RBAF crews. While synthetic training is on the up in Brunei, the same cannot be said of training in the actual aircraft. Sources in Brunei have told MTSN that out of the four aircraft in service, only one is currently serviceable. MTSN understands that the Brunei MINDEF have been in close contact with Pilatus but no consensus has emerged as to an acceptable price for the aircraft manufacturer to resolve the serviceability issues. The Pilatus PC-7 Mk. II flight training device.